Recently I had the enormous job of furnishing and outfitting an entire residence from top to bottom for its new European owners who purchased the traditional shingle style house as their seasonal holiday home. Located in a remote coastal setting on the South Shore of Nova Scotia the 7 bedroom main house and guest quarters are situated overlooking the water surrounded by many acres of woodland. The project didn’t involve any renovation or remodelling work on my end whatsoever, not even paint colours (!) my task of furnishing and outfitting the home mandated working with the existing spaces as is, and completing it all in as short of a timeline as possible so it could be used by the family without prolonged delay. This post takes a peak into the Master Bedroom. Room Design & Photo By: Carol Reed Interior Design Inc. Furnishing a home in its entirety is both an extremely exciting and challenging task under normal circumstances, however when you factor in a rural location that’s a 4 hour drive away from anything other than a Walmart and local hardware stores the logistical challenges suddenly dominate the process. Local sources are few and very far between - when the cost of delivery can often exceed the cost of an item, and where returns or exchanges just aren’t a feasible option, the job becomes an entirely different ‘sport’ than it would be in an urban area, one that requires a lot of endurance. Minimizing the amount of hours and distance spent driving, consolidating shipments and co-ordinating receiving at one locale (first leg of the journey) so deliveries could be made in bulk (the second leg of the journey) was a necessity, and easier said than done. (I should note this took place before the Ikea store opened in Halifax, so even “popping” in there (4 hour return trip) for some go-to essentials wasn’t even an option). I never like the concept of furnishing a room with all new everything, let alone a whole house. As with every space I design my approach for this project was to create a mix of old and new, contemporary and traditional. In this case with so much space to furnish, “old’ would play a key role in my strategy to meet timelines and budget, and source locally, while also delivering quality pieces with uniqueness and character. My clients were also determined that nothing need be custom or special order. Considering its setting and use, practicality and simple timeless style was the goal, while striving for an air of country elegance and maritime charm. Here’s a look at some of the finds that made the room unique. One of the first pieces I found for the room were a pair of late 19th century walnut side tables, with simple turned legs, flip tops and 2 drawers. I instantly though they’d be perfect bedside tables. At the time I found them they had a shiny eurathane coating on them in a darker stain so I had them stripped and left in their natural colour with an oil finish. The patina and of the wood is rich and warm, simply beautiful especially next to crisp white linens. The next key piece I found was a stunning Nova Scotia antique pine dresser, again late 19th century, in perfect condition with a gorgeous patina. This Master bedroom has a large walk-in closet so having this chest of drawers in the bedroom would serve as a wonderful accent piece that could house bedding, or personal items and provide some surface space for watches, eye glasses etc. With the key casegoods found I completed the rest of the space with new finds like the contemporary style slipcovered chair beside the dresser (above), bed, and a one of a kind wool area rug. 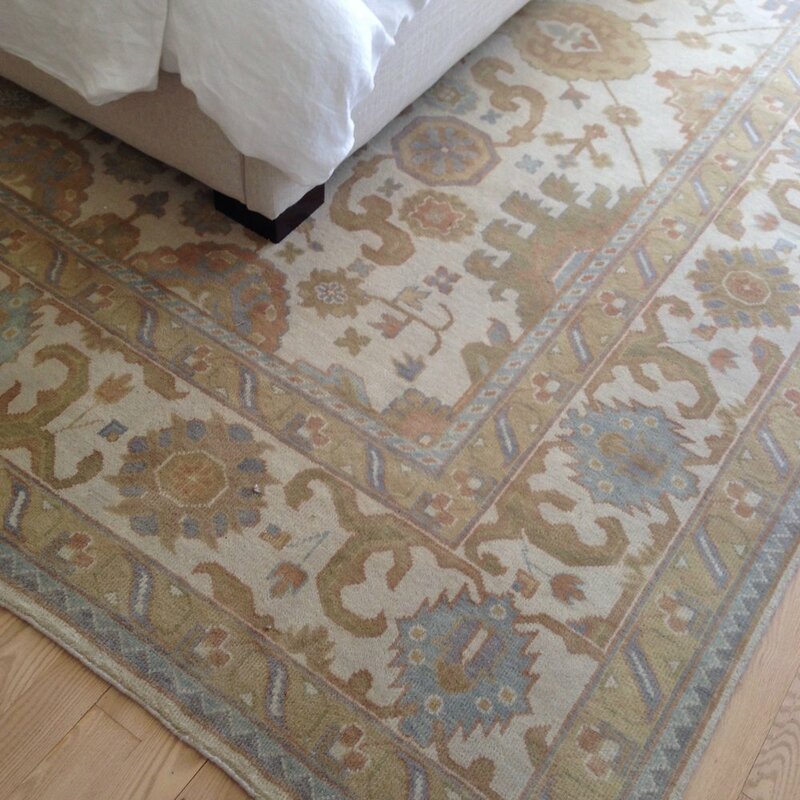 I selected this hand-knotted wool Oushak style rug with a wonderful combination of muted greens, blue and terracotta on a light taupe background. 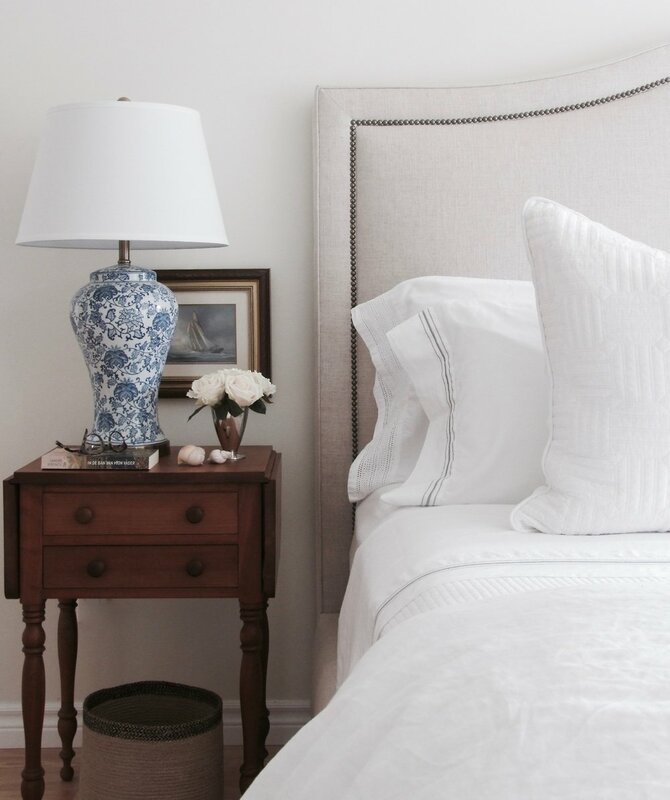 Although I outfitted the bed with white stone-washed linen the owners can easily mix it up and layer in coloured sheets, quilts or pillows from the palette of colours in the rug. I also planned the bedding from other bedrooms in the house so that any of it can be mixed and matched if desired. 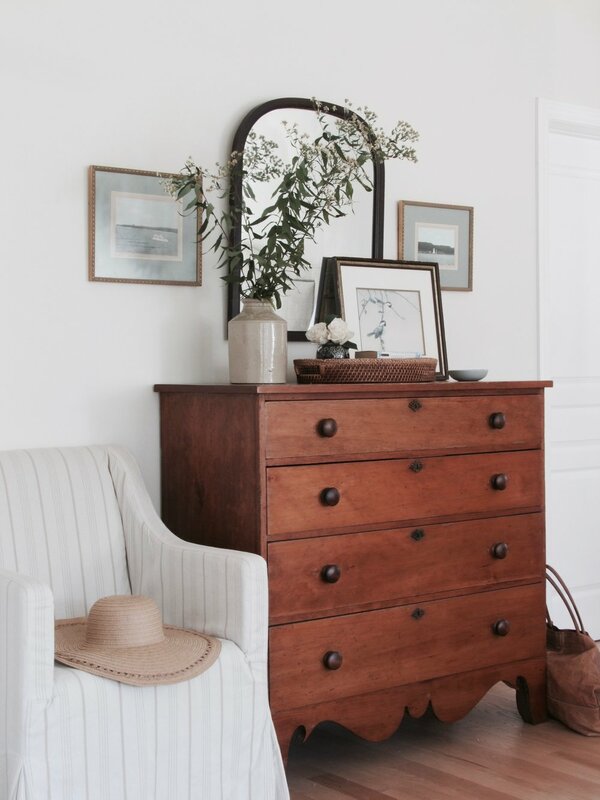 I love to pair antique casegoods and tables with contemporary pieces especially upholstery, again, similar to the simple lines of the chair beside the dresser I selected a contemporary bed frame to sit between the antique bedside tables. A view of the upholstered bed with the antique side tables and area rug during the installation of accessories (artwork & mirror hanging in progress). The bed is upholstered in an oatmeal coloured natural linen contrasted with with aged brass nail head detail and low block feet in a dark walnut. The texture of the linen and the dark metal detail give the bed a more relaxed informal vibe suited to the setting. The juxtaposition of the contemporary bed next to the antique tables is what gives these old pieces modern day style. From the onset of the project I was continually sourcing antique and vintage accessories, mirrors and wall art. Over the course of two seasons I amassed a large collection of various things in anticipation of adding finishing touches to all the rooms. After all the key pieces were installed in this room it was time to add the accessories and hang the wall art. It was important to me that not all the accessories be “new”, but for them to look like they’ve been collected over time. 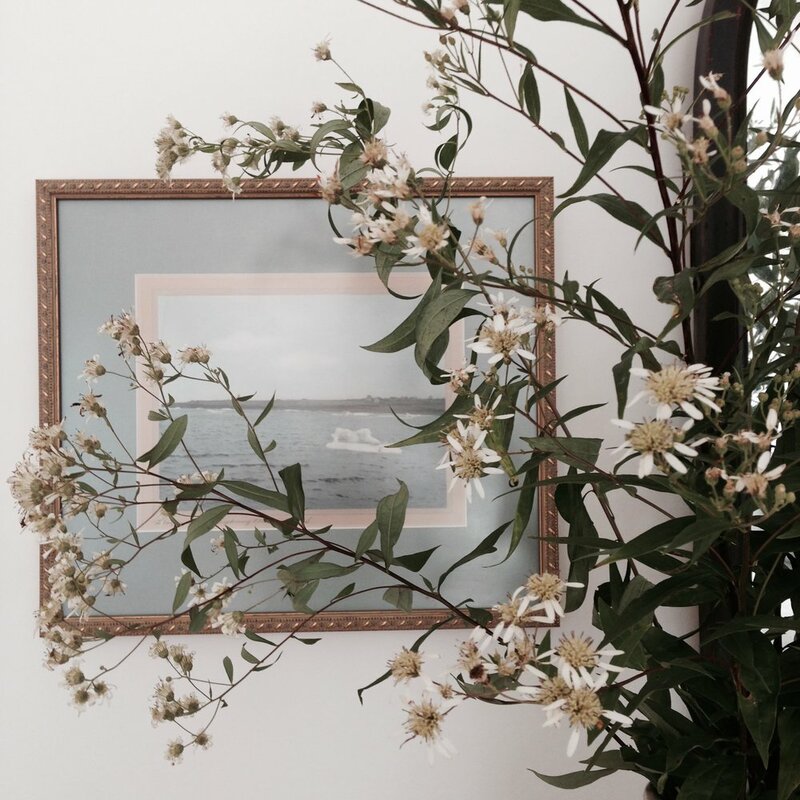 A favourite accessory I found was this framed vintage print of the Bluenose which couldn’t have been a more perfect accent for this room - the iconic schooner is a nod to Nova Scotia’s maritime history and the husband is a sailor and schooner owner himself. 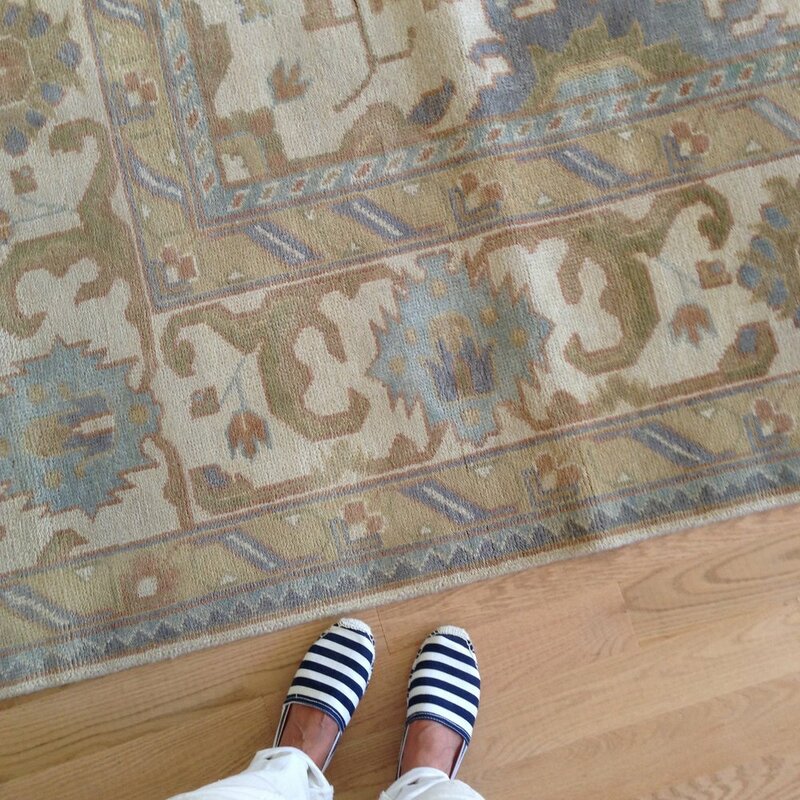 It’s a very subtle nautical touch without going all themey. The couple are also of Dutch heritage with their primary residence in Amsterdam and so inherently she has a deep fondness for blue & white porcelain. These classic blue & white foral lamps with antique brass base just seemed the perfect reflection of her taste and effortlessly just compliment everything else in the entire room. The sea shells I picked up on a nearby beach, which I’m sure are only the first of many found treasures that will make their way into the house. Its rare to come back from a hike or beach walk without a souvenir in hand. When it came time to accessorize the room I had no intentional plan, I simply pulled from all the things I had been collecting over the months and placing them together seemed to work with a natural ease. Everything on the dresser, except the wicker tray and small blue porcelain bowl are vintage or antique including; an arch top mahogany framed mirror with original glass highlights the pine dresser, its flanked by a pair of vintage, professionally framed black and white photo’s of the Cape Breton coast, (found as is I love everything about them with their aged gold frames and blue/grey mattes) a framed print of blue/white birds on a branch (vintage), an antique small blue and white ming vase filled with grocery store roses - because none of the rose bushes I planted in my garden were not blooming : (, and an antique crock filled with wild flowers foraged from the side of the road. A past client reached out to me last fall seeking help with planning cosmetic updates to their home, the updates would apply to the entire main floor and above grade lower level, similar to a split level style of home. The house located in a suburban subdivision had the original builder standard finishes which were looking dated and lacked any architectural features or character. One the of the most obvious challenges with the house’s design was that it was mostly open concept but with awkward transitions from one space to the next, ie; a change in flooring that didn’t align with any walls or doorways and tall vaulted ceilings comprised of varying angles and bulkheads with no trim work, symmetry, or alignment with doorways, walls or windows. Sometimes it takes a set of fresh eyes to point out design challenges or ‘flaws’ that exist but you didn’t know or understand how they were negatively effecting the space or how they would impact your attempts to improve or decorate them. An master design plan would need to be created to address these challenges while incorporating a new kitchen, all new flooring throughout, fireplace makeover, staircase updates, entry way updates, lighting updates, as well as proposed new built-ins and millwork. After assessing the floor plan as a whole, I developed design concepts for each room/area. This post is a glimpse at the proposed design for the dining room. Existing photos of dining room below. The dining room posed a challenge that I see often with builder homes - a lone room that’s located off the main entry/foyer making it islolated from the rest of the layout. In this case it had an awkwardly small half wall separating it from the front ‘hall’ and was not directly accessible to the kitchen nor open to the living room. Although it had tall arched windows and a partially vaulted ceiling (more odd angles) it was small in size and could only accommodate dining seating for 4 or 6. Because of this, my clients always used the large open concept, eat-in kitchen for all their entertaining while the small dining room was used only as overflow seating (usually for the kids). They love to entertain and host larger gatherings, they also love to read, have family game nights (board games) and occasionally work from home. Design Concept: My recommendation was to continue using the large extendable kitchen table for daily meals and entertaining, and make the small front dining room more useable and beautiful for day to day use by designing it as a library slash dining room - a place for their book collection, a place to do homework or work from home, a place to play board games and it would also be wonderfully flexible for entertaining - to set up a bar and appetizer buffet or coffee and deserts. Stylewise, i was striving for a timeless blend of contemporary with traditional arts and crafts references and a practical mix of high and low. Concept Option 1 : First, I addressed the physical details of the space. To add architectural interest I proposed eliminating the small half wall and building out a double thick, double wide entry trimmed out with new, substantially sized casing. Adding partial height panelled wainscot with a simple cap would add character to the room and a nod to the craftsman style the homeowners were hoping to evoke, painted in a fresh warm white along with all the other new trim throughout the house. To minimize the visual busy-ness of the angles at the ceiling line, and not draw more attention to the colonial arched lines of the windows I opted to keep the paint colour above the wainscotting a light neutral,,,this keeps it low contrast and thus doesn’t draw your eye to the irregular ceiling line as would happen with a dark wall/light ceiling paint colour. The room gets lots of daylight and so the goal was to just enhance the volume of ceiling height but not emphasize the opposing angles and arches. In addition to the new millwork the room would feature new wood flooring in a medium rich brown to replace the broadloom, a new large contemporary conical pendant, a pair of glass and bronze wall sconces, a traditional wooden pedestal table (with extendable leaf ) modern club-like upholstered arm chairs, and a richly coloured, patterned wool area rug. The light grey paint colour is a sophisticated and fresh compliment to the warm wood tones of the floor and furniture pieces. Concept Option 2: This concept is a variation of the first, but the subtle changes offer a distinctly different look. The cased entry into the dining room would be built with an approximately 16” wide nib wall on the one side to allow for wall-to-wall book shelving across the back wall of the dining room. (From the foyer looking in - this would be the wall on the right hand side.) In lieu of panelled wainscotting around the room this tall wall-to-wall shelving will add architectural character and create a library for their book collection. Topping the units would be articulating traditional brass library lights, highlighting the wall of books and emphasizing the ceiling height. In this scenario I opted for lush forest green velvet modern arm chairs with brass capped feet,, which really amp up the cozy factor and evoke that library mood. Again a large scale conical pendant light adds simple contemporary form and creates wonderful atmosphere suspended low over the table. The earthy colours, natural wood, millwork and built-ins are a subtle reference to the arts and crafts aesthetic these clients love so much but without trying to inject arts and crafts details in a home that’s not built in that style. Additionally if space allowed I would add a built in window seat. Both concepts offer solutions that are easily attainable with light construction work (not extensive) but the net effect will add distinct purpose and function to the room while creating a beautiful and inviting view to guests. Adding character through new millwork and builtins gives a high-end custom look to the interior without a high-end investment. The isolated nature of the room (from the rest of the floor plan) now becomes an appealing feature as a respite for homework or intimate cozy game nights or small dinner parties. On top of all that its also sure to make a stylish first impression. © Carol Reed Interior Design Inc. 2005-2018. All rights reserved.